When I got home from work Wednesday night I looked at Mr. Prevention and quickly to the dog as she jiggled and bounced with excitement and we collapsed onto the couch. “How will we ever have a family?” I asked. “We can’t even handle our careers and a dog,” I continued. “I know, right. ” Mr. Prevention agreed. The theme of Amy’s virtual baby shower is simple meals for new moms…and really busy people! New moms, working moms, bachelors, the career-driven work force…we all have our reasons for wanting a killer dinner on the table…3 minutes ago. Delicious doesn’t have take up half your evening, fill your dishwasher with one single creation, or have to come from a box. Yes, I’m referencing Hamburger Helper here, but there’s plenty of others. I grew up on the stuff (Ma, sorry to throw you under the bus on this one). My dad, to this day, thinks that Hamburger Helper is just about the best thing known to man, ESPECIALLY since you can purchase it at the dollar store. I mean, what’s better than that, right? Oh, dear. The crazy thing is, this hamburger helper is ready in practically the same amount of time as the boxed stuff. This one-pot meal is ready in 20 minutes or less which includes the time to brown the meat and cook the pasta. How about it? 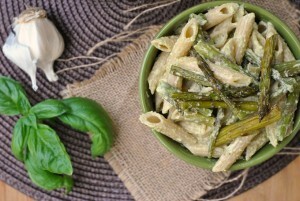 Super moms do exist, and dinner doesn’t have to be processed and from a box to be quick. 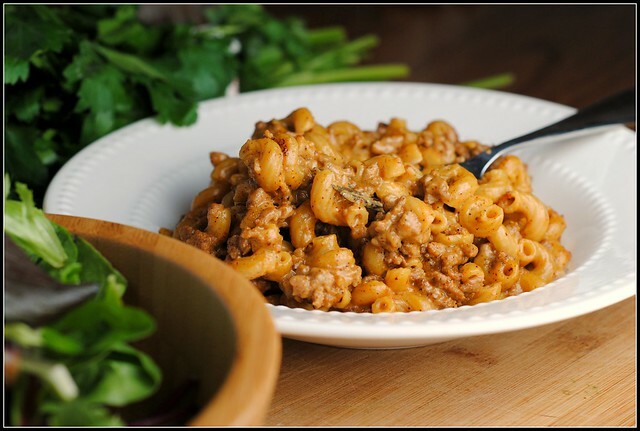 Made with lean ground beef, limited amounts of salt, fat-free milk, reduced fat cheese, and whole wheat pasta, this rendition offers up quite the nutritional profile, worthy of an approving head nod. Believe it! Amy, I wish you and your family all of the best! If this meal traveled well, it would be showing up on your doorstep. I hope the recipe will come in handy, however! Congratulations! Heat a large skillet sprayed with cooking spray over medium-high heat. Once hot, add the ground beef. With a wooden spoon, break up the meat, browning until cooked through and no longer pink, about 5-6 minutes. Add the pasta, milk, water, cornstarch, and spices; stir to combine. Bring to a boil and turn the heat down to low and simmer. Cover and cook for 10-12 minutes, or until the pasta is al dente. Add the cheese and stir to combine. Serve immediately. Result: Wow. I was shocked at how easy this meal was to make, in addition to how quickly it came together. This is good old comfort food that is guaranteed to please your kiddos and adults alike. A boxed meal can’t hold a candle to this. Homemade CAN be simple. Enjoy! This weekend is incredibly overdue. Next week is going to be a doozie, so I am going to make the most of this weekend — a combination of R&R and great workouts! You are seriously psychic. All week I’ve been craving pasta, and just last night I was looking at my soy crumbles in the freezer trying to decide how I could use them in pasta. 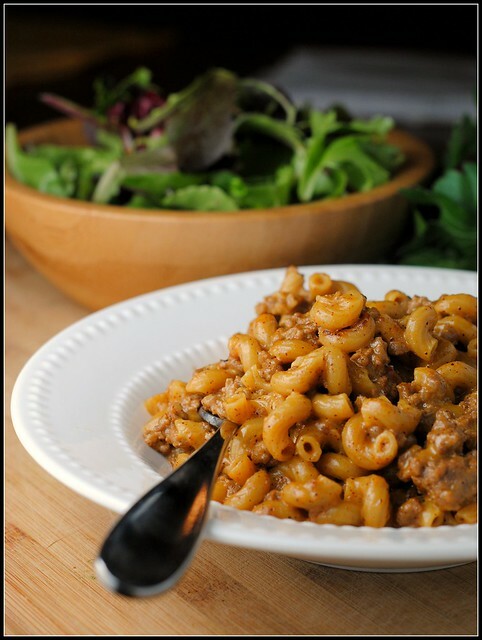 I grew up on Hamburger Helper and it’s probably been 6 years since I had it last, can’t wait to make this! I guessed Mac And Cheese….that was way too obvious!! Can you believe I’ve never had Hamburger HElper? Or at least not that I can remember. I mean, it always looked good, but we just never had it (and that doesn’t mean we didn’t have processed foods in the house, like Kraft Mac’n Cheese!). I don’t think I’ve ever had hamburger helper either, to be honest. awww congrats to Amy, how exciting! Your life always finds room for a little one (believe it or not!). This looks delish! I will have to add it to my weekly meal plan sometime! I too grew up on Hamburger Helper and can’t even touch a box now a days, my husband requests it. I will be trying this instead. We love homemade hamburger/chicken helper! It really is as easy as the boxed version, and so much better! 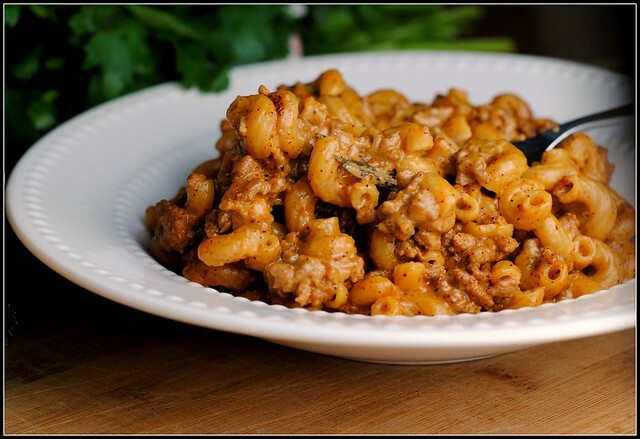 I always found Hamburger Helper to be fairly revolting, but I was spoiled by my mother’s excellent home cooking as a child 🙂 This, however, looks great! Yum!! This looks great and something that I’m sure everyone would love! Believe it or not, I’ve never had Hamburger Helper in my life! My Mom used to make something similar to your dish, although it had tomatoes in it, and called it slumgulion – I am sure she was just trying to stretch out ground beef by adding noodles and sauce! Hooray for an R&R weekend! This totally reminds me of my childhood! I haven’t had hamburger helper in so long and can’t wait to eat it again using this version! I think I’m going to try using soy ground round instead of the beef. Will let you know how it turns out! I say the same thing about having a baby..I can barely do it all now. I am so impressed that you blog daily. I have been slacking. It’s just so tough sometimes to find the balance. Great dish! Ahhhhhhhhh the baby fever is crazy in 2013 right? What a fantastic addition to Amy’s shower and it’s like you read my mind, I’ve had hamburger helper on my mind lately and don’t know if I wanted to buy the box mix but I can easily now make a homemade version! YEAH BUDDY!!! I think I’m totally going to get some ziploc bags and throw the pasta and spices into it with the directions to add the amounts o water and milk. We have 6 in our household so I’d be looking at 378 calories for a little over a cup serving. I could add a salad to that and make sure everyone gets their veggies. I haven’t had hamburger helper in ages. My family did like it but since most of it was high in sodium and low in fiber I just couldn’t justify it’s use once I had the opportunity to stay home. This version definitely looks to be much, much healthier. Comfort on a plate! I’m definitely more about easy meals now that Greta is here! I asked my kids what they wanted on the dinner menu this past week, and they said Hamburger Helper! I’m so making this next time they ask for it! I made this for dinner tonight and it was delicious!!! My husband couldn’t believe how much better if was for you and still tasted that good! I like it more than Hamburger Helper for sure! It was too spicy for my toddler so next time I may cut back on the cayenne and red pepper flakes. Thanks for sharing the recipe! This looks delicious! Did you drain the meat before adding all of the other ingredients? Made this tonight and it was outstanding!!!! So deliciously low-brow. It reminded me of my simple (and poor!) college days. All that was missing was a cheap beer in a solo cup. 🙂 This is going into my regular rotation. Thank you! Hahahaha, that is too funny! Yes, some Keystone Light in a red solo cup would’ve rounded out this meal perfectly! 😉 Oh, college…! Are all husbands the same? 🙂 Haha, thanks Suzanne!! 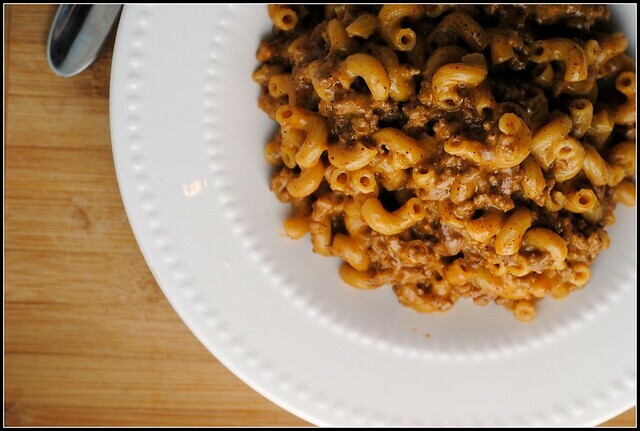 My husband loves the Hamburger Helper Chili Mac and I’ve been looking for a good homemade version that he would try for a little while now. I grew up on Hamburger Helper so I can tolerate it, but I don’t love it and will not let our toddler eat it. We’ll be trying this soon! He always adds diced tomatoes and chili beans (I’m sure lots of other kinds would work – like black beans or kidney beans)as well, so we’ll also add those to this recipe! I definitely like the extra fiber from the beans, and it’s a good way to help stretch the recipe to serve more people while still keeping everyone feeling satisfied! Uh oh, just added the cheese along w everything else. Hope still turns out ok.
Oh my Gosh…. Nicole! I made this for dinner last night and I was just hoping for an easy one skillet meal after a busy day at work, but oh my goodness it was so so so much more! 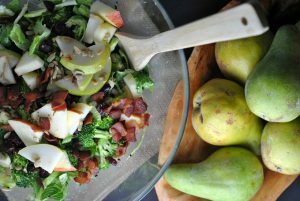 My mom would NEVER buy a box of that stuff when we were growing up so I have nothing to compare it to but there is just NO WAY it is as good as this recipe! My husband absolutely loved it and demanded it go in the weekly rotation. I just love your site! Thank you so much! This dinner was a WINNER!!! Hi Amanda! I apologize for the delay in my response, but I just wanted to say thank you…I’m so glad this was such a hit in your house 🙂 xo! Do you drain the fat from the hamburger before adding pasta or just add water, pasta, and spices to the liquid fat? I’m SO totally trying this!! Yes… life gets busier and busier. And the they become teens… and it gets busier again. When I met my husband I didn’t know how to cook and hamburger helper is what he served me. I haven’t bought the package stuff in years… but I’m betting he would love this! I thought this was really tasty HOWEVER (yes it is a big however) with that much chili powder and cayenne pepper my kids couldn’t eat it! And I didn’t even put in the full amount of chili powder. I thought it was a mistake that it said 1 full Tbsp of chili powder and only 3/4 tsp of paprika! Next time ill have to take out all the hot spices and then add a little to taste because my kids will usually eat foods with lots of onion, garlic and spices but this was just too much of a good thing;-( And if the kiddies won’t eat it then what’s the point?! This turned out great – thanks! Brought me back to my childhood 🙂 I tweaked the spices to make it more kid friendly based on the other comments and used 1 tsp. paprika, 3/4 tsp. chili powder, and just a pinch of cayenne. This was soooo good and super easy! Thanks for the recipe. is this dish pretty spicy?